Memari, Sanaz, Pazhouhanfar, Mahdieh. (1396). Role of Kaplan’s Preference Matrix in the Assessment of Building façade, Case of Gorgan, Iran. معماری و شهرسازی آرمان شهر, 10(20), 13-25. Sanaz Memari; Mahdieh Pazhouhanfar. "Role of Kaplan’s Preference Matrix in the Assessment of Building façade, Case of Gorgan, Iran". معماری و شهرسازی آرمان شهر, 10, 20, 1396, 13-25. Memari, Sanaz, Pazhouhanfar, Mahdieh. (1396). 'Role of Kaplan’s Preference Matrix in the Assessment of Building façade, Case of Gorgan, Iran', معماری و شهرسازی آرمان شهر, 10(20), pp. 13-25. Memari, Sanaz, Pazhouhanfar, Mahdieh. Role of Kaplan’s Preference Matrix in the Assessment of Building façade, Case of Gorgan, Iran. معماری و شهرسازی آرمان شهر, 1396; 10(20): 13-25. 1M.A. of Architecture, Faculty of Engineering, Golestan University, Gorgan, Iran. 2Assistant Professor of Architecture, Faculty of Engineering, Golestan University, Gorgan, Iran. Buildings play a key role in organization and arrangement of city appearance. Specially, their facades have profound impact on the quality of urban landscapes while playing an important role in assessing urban environments by citizens. The introduction of superior building facades in terms of popular preferences is mostly based on visual elements of building facades. Furthermore, aesthetic preferences should not be explored without investigating the consequences of their interaction with environment which forms mental concepts; whereas, few studies have explored building facades based on preference of observer. Therefore, current research has been conducted as a survey in order to evaluate the role of each variables in Kaplan’s preference matrix on building façade preferences. Our questionnaire was based on information factors including “coherence”, “complexity” and “mystery”, while excluding “legibility”. In this survey, 100 respondents have rated their preferences for 48 building façades located in Grogan, via a photo questionnaire. Data collected from the questionnaire were analyzed by using SPSS software. According to the correlation test, there was a significant correlation between preference and triple information factors (coherence- complexity- mystery). Furthermore, according to the regression test, the model consisting triple information factors (coherence-complexity-mystery) can predict 62.3% of preference toward building facades. In addition, it was revealed that complexity and mystery are significant in predicting the preference for building facades compared to cohesion. Finally, it is suggested that the focus of design on building facades should be based on complexity and mystery as they make building facades to be more preferred. Abbasalizadeh Rezakolai, S., Samadi, D., & Tabatabaian, M. (2015). Analysis of Persian Gardens Using Kaplan’s Landscape Preference Theory (Case Study: Fin Garden, Shazdeh Mahan Garden, Eram Garden & El Goli Garden). Iran University of Science and Technology, 25(1), 6–20. Bell, S. (2012). Landscape: Pattern, Perception and Process. Routledge. Berlyne, D. E. (1974). Studies in the New Experimental Aesthetics: Steps Toward an Objective Psychology of Aesthetic Appreciation. Hemisphere. Carmona, M., & Tiesdell, S. (2007). Urban Design Reader. Routledge. Crozier, J.B. (1974). Verbal and Exploratory Responses to Sound Sequences Varying in Uncertainty Level. Studies in the New Experimental Aesthetics, 27–90. Galindo, M.P., & Hidalgo, M.C. (2005). Aesthetic Preferences and the Attribution of Meaning: Environmental Categorization Processes in the Evaluation of Urban Scenes. International Journal of Psychology, 40(1), 19–26. Gifford, R. (2007). Environmental Psychology: Principles and Practice. Optimal Books Colville, WA. Gimblett, H. R. (1990). Environmental Cognition: The Prediction of Preference in Rural Indiana. 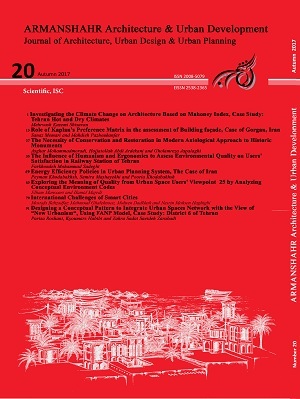 Journal of Architectural and Planning Research, 222–234. Herzog, T.R. (1989). A Cognitive Analysis of Preference for Urban Nature. Journal of Environmental Psychology, 9(1), 27–43. Herzog, T.R., & Kropscott, L. S. (2004). Legibility, Mystery, and Visual Access as Predictors of Preference and Perceived Danger in Forest Settings without Pathways. Environment and Behavior, 36(5), 659–677. Herzog, T.R., & Shier, R.L. (2000). Complexity, age, and Building Preference. Environment and Behavior, 32(4), 557–575. Ikemi, M. (2005). The Effects of Mystery on Preference for Residential Facades. Journal of Environmental Psychology, 25(2), 167–173. Kaplan, S., & Kaplan, R. (1983). Cognition and Environment: Functioning in an Uncertain World. Ann Arbor, MI: Ulrich’s Google Scholar. Kaplan, S., Kaplan, R., & Wendt, J. S. (1972). Rated Preference and Complexity for Natural and Urban Visual Material. Attention, Perception, & Psychophysics, 12(4), 354–356. Nasar, J.L. (1997). New Developments in Aesthetics for Urban Design. Advances in Environment, Behavior and Design, 4, 149–193. Ode, Å., & Miller, D. (2011). Analysing the Relationship Between Indicators of Landscape Complexity and Preference. Environment and Planning B: Planning and Design, 38(1), 24–40. Porteous, J.D. (2013). Environmental Aesthetics: Ideas, Politics and Planning. Routledge. Rapoport, A. (1990). History and Precedent in Environmental Design. Springer Science & Business Media. Reeve, A., & Simmonds, R. (2007). EVALUATING COMMERCIAL SIGNS IN HISTORIC STREETSCAPES : the Effects of the Control of Advertising and Signage on User’s Sense of Environmental Quality. Adriana Araujo Portella Supervisors, (July). Rosenthal, R., & Rubin, D.B. (1986). Meta-analytic Procedures for Combining Studies with Multiple Effect Sizes. American Psychological Association. Salingaros, N.A. (2003). The Sensory Value of Ornament. Communication & Cognition. Sanoff, H. (1991). Visual Research Methods in Design, Department of Architecture, School of Design and Environment, North Carolina University. Van Nostrand Reinhold, New York. Van der Jagt, A. P. N., Craig, T., Anable, J., Brewer, M. J., & Pearson, D.G. (2014). Unearthing the Picturesque: The Validity of the Preference Matrix as a Measure of Landscape Aesthetics. Landscape and Urban Planning, 124, 1–13. Wohlwill, J.F. (1968). Amount of Stimulus Exploration and Preference as Differential Functions of Stimulus Complexity. Attention, Perception, & Psychophysics, 4(5), 307–312. Yang, B.E., & Brown, T.J. (1992). A Cross-cultural Comparison of Preferences for Landscape Styles and Landscape Elements. Environment and Behavior, 24(4), 471–507.